If you're new to the heads up game, you can really get crushed by rushing in blindly. Proper heads up strategy is vastly different than normal No Limit Hold'em Strategy, and you need to make the correct adjustments in order to beat your opponents and make money. I recommend following the 10 tips below to help you get started and learn the basics, then read the rest of our heads up poker strategy to fine tune your game. Good luck. The first tip you need is to open up your starting hand ranges. Since you only have two players at the table, the average starting hand that sees the flop is going to be much worse than at a normal 9-handed table. Because of this you should open up your starting hand range. You can't afford to wait for premium hands while playing heads up because you're in the blinds every hand. I recommend playing the majority of your hands as the big blind, and playing damn near every single hand when you're the dealer. Learn more differences between heads up and 9 handed poker. 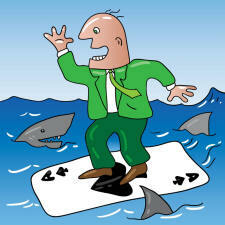 Position becomes a huge factor in heads up poker, because you are either in the best position or in the worst position every hand: there is no in between. Like I mentioned before, I recommend playing every single hand when you're in dealer position. When you're the dealer, you'll post the small blind, act first preflop, and act last on the flop and beyond. When you're the small blind, you'll post the big blind, act last preflop, and act first on the flop and beyond. Because of this, you want to be really aggressive preflop as the dealer, and raise with a wide range of hands (think any pocket pair, any suited connector, and two big cards, etc). Also, you should be more conservative as the big blind, and respect raises from the dealer. As I mentioned in tip #1, the starting hand values go way up in heads up poker. The same goes for showdown hands. The average winning hand in heads up poker will be much worse than the average winning hand at a 9-handed game, so adjust accordingly. Even hands like middle pair or second worst pair are still decent hands and will probably win an uncontested pot, so bet them out. A great way to pick up a bunch of pots in heads up poker is by firing out smallish bets into un raised pots. When I'm playing heads up I like to bet a ton of flops as long as I get any piece; even a straight draw or bottom pair is worth taking a shot on the flop. If my opponent calls I'll slow down, but most passive opponents will toss basically any hand but top pair or maybe second pair to a bet. This is basically the opposite of the above tip. If you're playing an aggressive opponent, you'll have to make a stand to prevent constant semi-bluffs and preflop raises. I like to re-raise on occasion preflop, and to call the majority of the flop bets to see if my opponent will bet again on the turn and river. Even if you only have middle pair you should look him/her up to keep them honest, or he/she will continue to pummel you in every pot. This relates to tip #3 because with lower winning hands you'll have to extract value from hands you normally wouldn't. For example, when you have middle pair on the river you should bet because it is likely you're ahead and will get called by third pair or worse. Also, when you have an extremely strong hand I like to make small bets on the flop, turn, and a larger bet on the river to get maximum value out of my opponent by reeling them in. Throughout the course of a heads up battle, you'll gain reads on your opponent, and he/she will gain reads on your play as well. As you pick up common plays and tendencies of your opponent, you need to make adjustments to counter their most used moves. For example, if you notice that your opponent is always checking the flop and betting the turn when he/she flops top pair, make sure to fold more on the turn if that same situation comes up. This is just the opposite of the last tip. As you're picking up reads on your opponent, he/she will be doing the same. Because of this you need to switch up your play to keep them guessing, especially if you are in a long heads up battle that spans over an hour. To keep your opponents on their toes, make sure to alternate between betting flops and checking them when you hit, and throw in an occasional strange play like a big bluff or a check-raise. Learn more about switching up your game. This is an important tip for heads up players. When you battle your opponent down to a small stack, you have to finish him/her off and not let him/her back into the match. To do this, you can't give them any easy double ups or get lazy and call off big bets. The easiest way to let a crippled opponent back into a match is to call preflop all-ins with a poor hand just to try to knock them out. Continue to play your normal game, and you'll finish them off quickly. One common mistake that new players make is playing heads up cash tables with their whole bankroll. This is a big mistake, and will almost surely leave you broke. I recommend never playing with more than 1/10th of your entire bankroll if you're a casual player, or more than 1/50th of your stack if you're a professional or serious player.